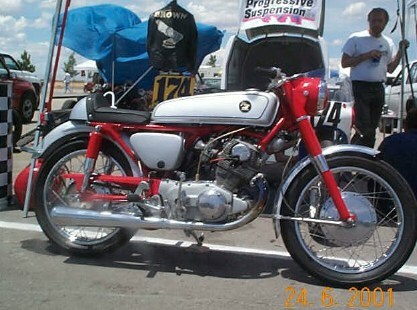 Honda CB77 powered ahrma roadracer. The bike with the fairing is a 1962 305 superhawk based copy on the early RC factory racers. I finished the 2000 racing season with AHRMA 3rd in the USA in 350 GP class. The frame is hand made from the steering head back to copy the RC frames. Suzuki waterbuffalo front brake, Yamaha RD forks. CB350 swing arm. Tank is a fiberglass copy of a CR110. Front fender is CB 160. Fairing is copy of CR77. Progressive Alloy body shocks and fork springs. Motor has CYB Racing 5 speed. 360 degree dream crank. Kawasaki 650 pistons. Megacycle cam. Flowbenched head. 2 into1 tuned exhaust with reverse megaphone. Barnett kevlar clutch w/ HD springs. Bike is easy to ride and has loads of torque. Except for starts.First gear in these CYB Racing 5-speed is VERY tall. Hard on Clutches. 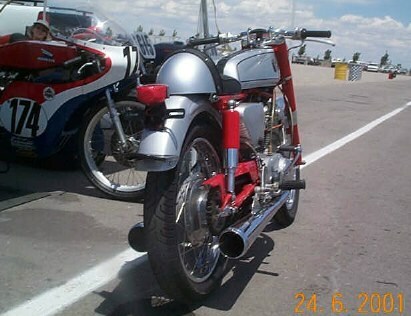 The unfaired bike is a 1971 SL 350 honda. I just finished and will run the 2001 season in AHRMA's sportsman 350 class. (no fairings allowed) The frame is a braced up stock 1971 SL350 frame. Suzuki T500 front brake and forks. The tank and seat are aluminum hand made from England to fit a Stock CB77. They fit the sl frame with very little modification. Aluminum wm2 and wm3 Sun rims. The motor has Henning Copy pistons, Megacycle cam, HD valve springs, reworked head, Dyna tech electronic ignition and coils w/ total loss system. Hand made TT style Exhaust. Front fender is Honda GB500. Bike runs VERY strong, is terribly durable and is an absolute hoot to ride. I just completed. It's a 1963 CB77 with Honda CR110 copy tank and seat. combination of velos and open megaphones make great music!! The Avon RR compound tires help it to handle respectably as well.